Mount Royal USA Inc. is a distributor of farm raised game meat products. Game meats can address your needs for creating new daily specials and unique menu entrees. Kangaroo sirloins, ostrich filets, venison fajitas, and buffalo ribs can all provide taste appeal, memorable presentation, nutritional attributes, and uniqueness. All meat is USDA approved and free of growth hormones, steroids, and antibiotics. It is low in fat, cholesterol and calories, yet high in proteins, minerals, and taste appeal. We believe in your success and would like to assist you in making game meats part of the offerings at your restaurant or catering event. We can provide product to you via mail order. All orders are shipped via UPS using a blue two-day service. All items are shipped in insulated boxes with frozen gel packs to help insure freshness. There are no minimum order requirements and we look forward to insuring your total satisfaction with all our specialty meat products. For Houston customers we can provide local deliveries. 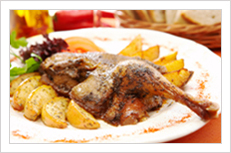 We invite you to try our specialty game meat products. They are chef friendly, easy to prepare, low in fat, cholesterol, and offer unique entrée ideas. If you have an interest in a cut of meat not specified below, be sure to contact us for assistance.